It’s an added comfort when you can remotely monitor your home from anywhere. 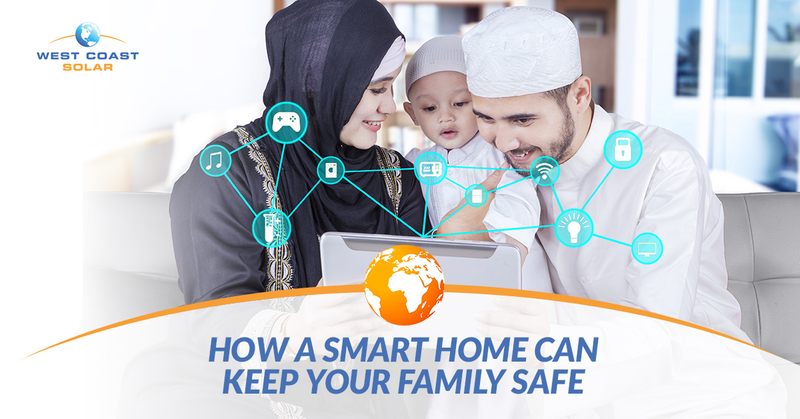 Whether your kids are home alone, or you’re on vacation, you can keep your home and family safe with smart home technology. One aspect of a smart home many consider is a smart security system. It’s a great investment to ensure the safety of your family. A huge component of smart technology is the power source. Will you tap into the traditional non-renewable grid, or will you rely on a renewable storable energy source? West Coast Solar believes in solar power. It’s clean. It helps keep people and the environmental health. Most importantly it keeps your family safe—even when there is a power outage. Want to learn more? Read on! Lights left on? Locks not secured? Garage door left open? It’s all connected with a home automation system. At the tap of a button on your phone, tablet, or computer, you can dim the lights, lock the doors, and close your garage from anywhere with an internet connection. With some systems, it does all of this for you. Pair a home automation system with a home security system and keep your family safe. If you forget to lock the doors or activate the security system, an automated setup can help. Which home security provider will you choose? How extensive of a security system do you want? This is a great place to start when it comes to choosing a system. You want to be able to meet your needs while also staying within your given budget. Nothing is more important than keeping your family safe at home. Not only can an automated security system keep your family safe inside, it can also alert you to abnormal or suspicious activity at your home. Once your home security system is installed, you’ll need to power it, which is where West Coast Solar comes in. A home battery allows for the storage of collected energy. This means your solar energy is used as you need it, even when the sun isn’t out in all its glory. If the power “goes out” around town, you’ve got solar. A solar battery offers a supply of stored energy to use around the house, whether it be keeping the air conditioning running or the lights on. The home battery allows for your smart home to continue functioning as needed to keep your family comfortable and safe from a potential power outage. Motion sensors: Installed on your doors and windows, these sensitive sensors activate, track, and log the slightest disturbance. This keeps your family safe if someone is considering breaking in or sneaking out. Door locks: A serious and fun feature. You can allow access or deny access to someone remotely with smart locks on your doors. From anywhere, you can lock or unlock your home from an app. Doorbell camera: A great way to keep your kids safe if they stay home alone and want to see who’s at the door before they answer it. It’s also another way to unlock and lock the door for your family and friends as they arrive or as they leave if you’re not at the home. Smart Fire Protection: Making the simple switch from traditional smoke alarms to smart smoke alarms offers a few benefits: instant alert notification, remote battery monitoring, and third-party applications to notify local fire services. Whether you’re keeping your family safe, or unlocking the front door to let in friends, smart home technology, especially a security system, offers many benefits. You can remotely monitor your home from anywhere on an app. And you can be alerted if your sensors pick up abnormal activity. With a solar battery from West Coast Solar, you conserve and use energy as you need it. It’s important to keep your family safe at home, but it’s imperative you choose the right power source to keep your system up and running properly. West Coast Solar has been serving property owners across Northern California with solar panel installation and power conservation and use for more than a decade. If you’re considering going green with your home, give West Coast Solar a call today!